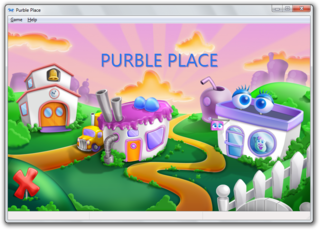 Purble Place is one of the new games (or, rather, a collection of games) included with Windows Vista and 7. The collection is intended for very young children and it shows. See if more of the options work in the Vista version. This was tested with the Windows 7 version. There's much more to document. A good place to start would be to use Resource Hacker on the game executable and DLLs. Add sub-page for "Media Center Purble Place", a full-screen version of the game embedded into the game's executable which although is technically used as it can be launched from Windows Media Center, it is not documented in any Help menus, and it also contains a whole bunch of unused content the normal game doesn't. Multiple prototypes of this game exist in various Windows Longhorn/Vista Beta builds, collect all of them and create a Prototypes sub-page. As with most other games shipped with Vista and 7, it has an internal g_debugEnabled variable. However, the debug menus aren't seen until entering one of the mini-games. 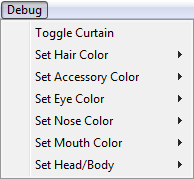 The only part of the menu that appears to work is "Toggle Curtain", allowing the player to see behind the curtain. The rest appear to have been for the figure the player has to guess for, but they don't appear to be functional. The options consist of trying to pick the graphics currently available. The only option that appears to work is "Win Game", which does indeed let the player win. "Reload Variables" doesn't appear to do anything on the surface, while "Time Attack Mode" might be a scrapped game mode. You can indeed lose in this game on harder difficulties, and also, harder difficulties have a timer (it's how you lose). Retry the Force Lose and Time options on a harder difficulty and try again. Sneak Peak - Lets the player look at all the tiles, but only if none of them have been flipped. Force Win - As you'd expect, the player automatically wins the game. Mixer - Mimics the sundae dessert "power-down"; the tiles are moved all across the playfield. Add where Purble Pairs is referred to as this..
Internally, Purble Pairs is just called "Concentration". An interesting feature that isn't documented anywhere (Help Menu-wise) is XInput (gamepad) support – if the game detects an Xbox 360 controller plugged into a USB port, the P1 corner on the controller will light up, signifying the controller can be used. Possibly undocumented because Microsoft thought people were too used to the traditional controls, and little kids wouldn't be using a controller. It's a neat little feature, nonetheless. Left analog stick/D-Pad/Shoulder Buttons/Triggers Moves the cursor. Oddly, they can also be used to navigate the menu bar. A/X Selects whatever the cursor is on. Y/Start Opens the Game Menu. This page was last modified on 18 April 2019, at 18:04.